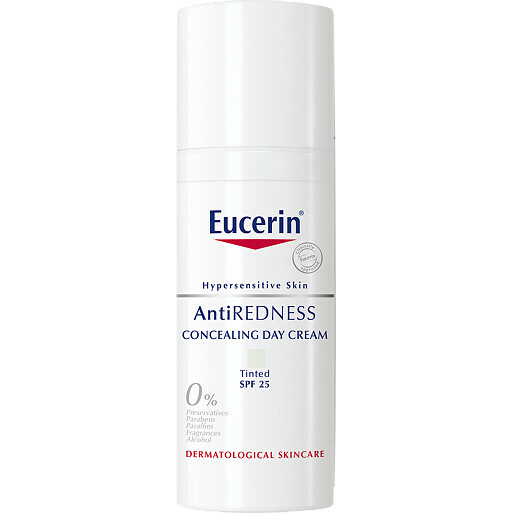 Get immediate relief for your redness-prone skin with the Eucerin Anti-Redness Concealing Day Cream, a cooling daily moisturiser with SPF25. There are many things that cause redness and diffuse flushing, from internal factors like stress and skin conditions, to external aggressors such as UV exposure and the weather. This soothing Cream works to provide immediate calm, which helping to reduce long-term redness within 4 weeks. Created with colour neutraliser technology, this green-tinted Cream counteracts the appearance of redness for an even-toned complexion. Added liquorice extract quickly calms and soothes to relieve heated skin, while a highly tolerant sunscreen of SPF25 protects against the sun related damage that triggers further redness. Apply a small amount of fluid to the face every morning after cleansing. Very red areas may require another application. Non-comedogenic, excellent efficacy for sensitive skin. 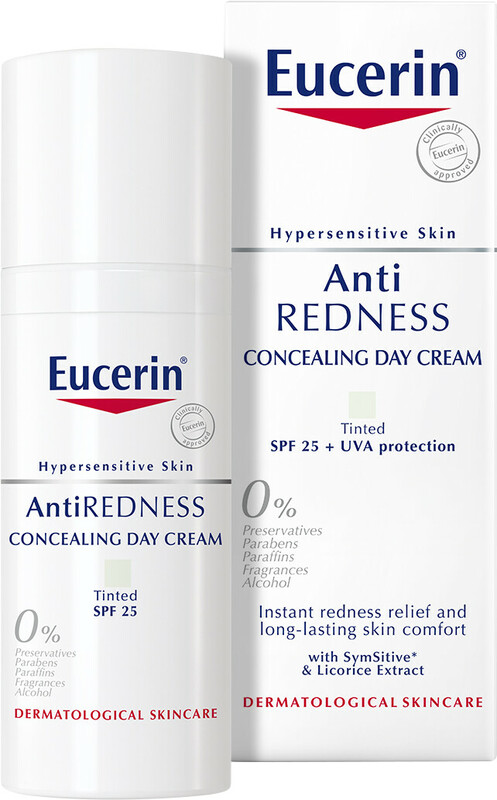 Eucerin Anti-Redness Concealing Day Cream SPF25 50ml is rated 4.5 out of 5 by 6. Rated 4 out of 5 by Lizm from Good product I suffer with rosacea and broken veins. Finding an affordable product for everyday use has allways been challenging. However this cream really helps, it is Rich and creamy but not greasy and stays where you place it!! Doesn't cake or flake on my mature skin. What is more at Esentual I could get it at an affordable price! Delivery was in the blink of the eye. Excellent service and a new firm favorite to combat my rosacea! Rated 5 out of 5 by IamGroot from it really works...really well! So after years of trying various moisturizers, I have finally found one that actually reduces the appearance of redness on my cheeks! Not only that, it also gives an all over even tone (i guess because of the concealer), what's more, my skin maintains this even complexion throughout the day! (if a bit shiny/greasy). It does not sting or irritate my skin, it doesn't have an unpleasant smell. The consistency is lighter than an overnight cream and not as light as a gel moisturizer. The green colour reminds me of a face mask but that quickly disappears with application to the skin (obviously). Like I said, I do find it makes my skin quite shiny BUT given that everything else about this product is PERFECT, i can deal with a little shine. Besides my skin looks so well, even and almost glowing probably because of this shine. Additionally, if I want to rock the 'natural' look than this product alone, achieves this! Before I would apply make up in such a way that it might look like I was't wearing any but with this product, I feel totally happy and confident using the moisturiser alone for an actual 'natural' look. Finally, I feel like even if I didn't use this product for one day, my skin would retain the even tone and reduced redness because the benefits are really skin deep, that and the high SPF! I really rate this product, and would recommend to anyone in search of an anti-redness product. Rated 5 out of 5 by Daltonian from Excellent Just bought this product on a whim and would like to recommend it to any person like myself that has red sensitive skin. For me it worked wonders not only covering my red (I had to apply extra to certain areas) but calming the skin down. This will be my staple product for every day and will be buying again.